Baylor Football defeated Texas Tech 35-24 in the regular-season finale at AT&T Stadium in Arlington, Texas, and with that win became bowl eligible. The Bears subsequently earned an invitation to the Texas Bowl against Vanderbilt University from the Southeastern Conference. It was the program’s 24th all-time bowl appearance and eighth in the last nine seasons. It also was Baylor’s second Texas Bowl appearance (2010 vs. Illinois). The Bears’ five-win regular-season improvement from the 2017 season matched Florida and Syracuse as the best improvements among Power Five programs. Only Georgia Southern (seven wins) and Cincinnati (six wins) had better improvements than Baylor among all Football Bowl Subdivision teams. Receiver Jalen Hurd was named Big 12 Conference Newcomer of the Year. Punter Drew Galitz earned first-team All-Big 12 honors, while defensive lineman James Lynch and linebacker Clay Johnston were second-team all-conference honorees. Junior middle blocker Shelly Fanning and sophomore outside hitter Yossiana Pressley earned American Volleyball Coaches Association (AVCA) All-America honors for the second consecutive season. Fanning was a second-team selection, while Pressley earned honorable mention. Both were honorable mention picks in 2017. Fanning joins Katie Staiger (2016) as the program’s only second-team All-Americans; no Baylor Volleyball player has ever earned first-team honors. Pressley and Fanning were both unanimous first-team All-Big 12 Conference selections and AVCA All-Southwest Region honorees, as well. Additionally, Fanning, who is a sport management master’s student, was named Big 12 Scholar-Athlete of the Year. Baylor was 20-9 on the season, reaching the NCAA Tournament for the third consecutive season and finishing second in the Big 12 for the second straight season. The Bears defeated perennial power Hawai`i in the first round of the NCAA Tournament before falling to No. 15 national seed Oregon in a thrilling five-set, second-round match. For the fifth consecutive year, Baylor student-athletes graduated at a higher rate than their counterparts at any other Big 12 Conference school. The University led the Big 12 in Graduation Success Rate (GSR), a metric developed to assess academic performance of student-athletes. The GSR title is Baylor’s ninth overall; Baylor has finished either first or second in 10 of the last 12 years. Baylor’s overall score of 90 was two points higher than the University of Texas at Austin and Iowa State University, who tied for second place. Four Baylor sports finished with the top possible score; men’s golf, women’s golf, soccer and women’s tennis all finished with perfect 100 sores. During Homecoming festivities, Baylor dedicated the Billy W. Williams Golf Practice Facility and Clubhouse. The venue provides the latest advances in training and support for Baylor golf student-athletes while preparing them as Champions for Life. 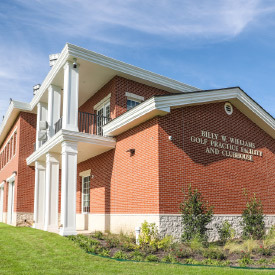 Williams, BBA ’63, and his family of Hinsdale, Illinois, provided the multimillion-dollar gift for the facility in 2015, months before his death Dec. 14, 2015, at age 74. His wife Elaine, their three children and extended family members attended the dedication ceremony. The Billy W. Williams Golf Practice Facility and Clubhouse is located on a 16.5-acre site along University Parks Drive. It includes a practice course, driving ranges and a 7,975-square-foot clubhouse for Baylor’s nationally recognized men’s and women’s golf teams. On the course, Baylor’s men’s team claimed the 2018 Big 12 Conference Match Play Tournament title in October, defeating Kansas 5-1 in the title match. 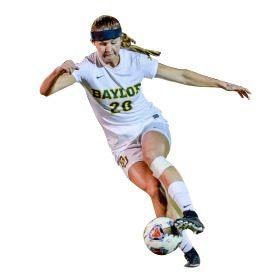 Baylor Soccer claimed a Big 12 Conference title, won more games than any team in program history and matched their deepest postseason run in a 2018 season that continued the program’s ascent to be one of the nation’s best. Hopes were high following the 2017 season, when the Bears reached the national quarterfinals for the first time. Baylor began the year with a top 15 national ranking and subsequently built a résumé that led the Bears to their highest postseason seeding. Baylor reeled off eight straight victories in conference play to claim the program’s fourth Big 12 title. Their impressive regular season schedule included victories over four teams that reached the NCAA Championships, and two Top 25 opponents in Butler and West Virginia. The Bears earned a No. 2 national seed in the NCAA Tournament, Baylor’s highest perch in program history. Home victories over Abilene Christian, No. 13 Vanderbilt and No. 12 Virginia propelled the Bears to their second-straight Elite Eight, where they fell to top-seeded Georgetown. With a final record of 20-6, the Bears set a program record for victories and finished with a No. 11 national ranking. Head coach Paul Jobson was named Big 12 Coach of the Year. Julie James and Sarah King earned first-team All-Big 12 honors, Jennifer Wandt and Camryn Wendleandt were named to the second team, and Taylor Moon and Kayley Ables were All-Freshman selections.